Hati, for a whole expansion you and I traveled around the Broken Shore and backwards onto other continents, defeating the Legion and others while I wielded Titanstrike. At the time I rather missed the solitude of just me and my bear — traveling the world and taking out the bad guys as a duo — but when it was announced you were returning to Thorim, I was genuinely sad. We’d spent a lot of time together and I knew — in a small way — I’d miss you. I wasn’t the only person who took you back to the place where I’d met you so you could roam free amongst the Storm Peaks. Then it was teased that maybe Hati wasn’t gone for good. As Patch 8.1.5 approaches, we have more information on Hati’s return. If you could dress Hati up with one accessory, what would you choose? Word off the World of Warcraft PTR is that Hati is coming back in a big way. Data mining seems to have determined the quest line to renew Hati goes from The Storm Peaks to Silithus and our quest is to make Hati whole again. Once this is done, there appear to be six new skins. The first five tints will be familiar to hunters who managed to unlock them in Legion. There is one new tint coming as well. Called “Hati Sacrifice Tint,” it’s not known what this actually means — although we’ll learn soon enough. I’ve never been a fan of wolves as my Hunter pet of choice. 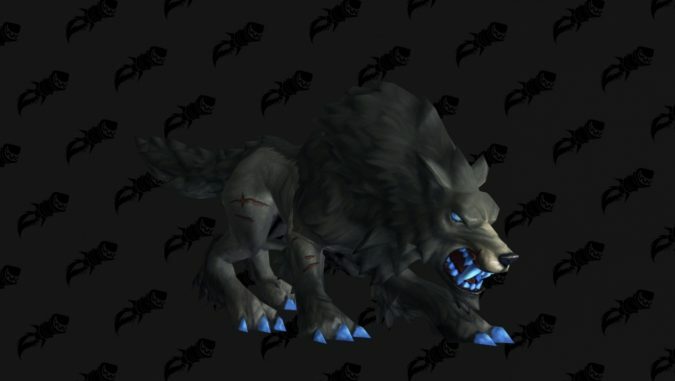 During Wrath of the Lich King, wolves were one of the best DPS pets, but that wasn’t enough for me to run out and get one. 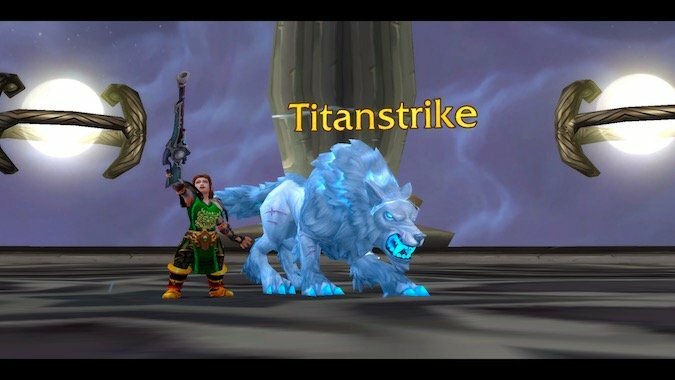 There was a time — before it was nerfed — when you could get an oil covered wolf from The Geyser Field in Borean Tundra. I thought that was cool but couldn’t get there to tame one before it was gone. I did like the various skins of Hati, however. I’m partial to the dark skin with the blue teeth and I did like the Boarshot Cannon skin, so I’m probably going to run with the Sacrifice skin. It just looks cool. Enough about the skins — five new collectible items have been given to Hati. The community responded to Feasel’s initial tweet with a wide variety of suggestions from armor to Pepe to a hat. Lo and behold, Hati is getting a hat called the Voltweave Fez. Other items in Hati’s customization kit include Jolt Jerky, which you can feed to Hati. It seems Hati can get overly excited when you feed him and jump up to lick your face causing nature damage. Damage? Really? Everyone knows dogs have a calming presence. There’s the Charged Sparkstone which visually enhances Hati’s lightning. You can toss a Rubber Ball to play with Hati. And — what might be most exciting — Ironspine Protocol, which appears to cause Hati to grow in size and become a mount. I’m already salivating at the screenshot potentials of this. Okay, I wasn’t a big Hati fan. I understood how he fit in with the story of Beast Mastery hunters but there were things about pet which annoyed me. I’m still — very much — a “me and my bear” Hunter, but I’m excited about re-meeting Hati. Time to start planning the transmog sets to go with him!